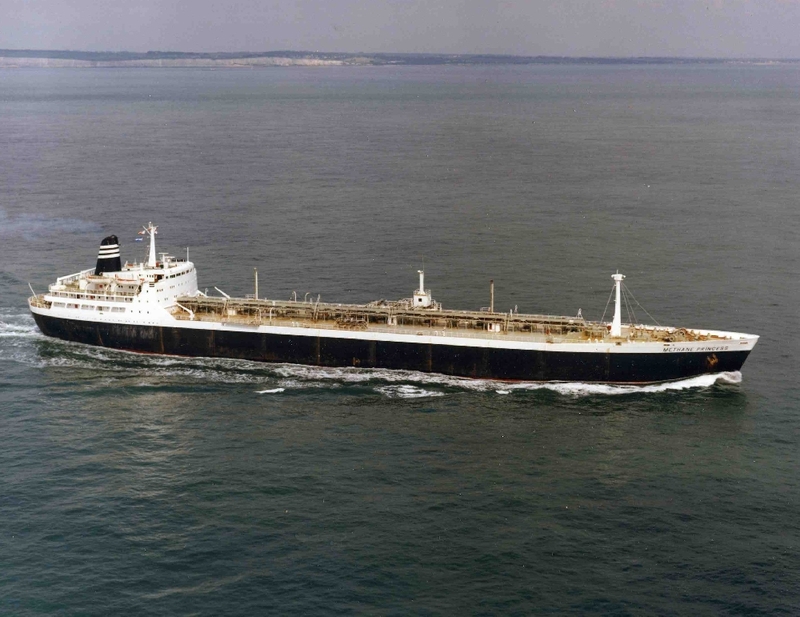 Completed 1964 in Methane Princess for Methane Tankers (STUK). 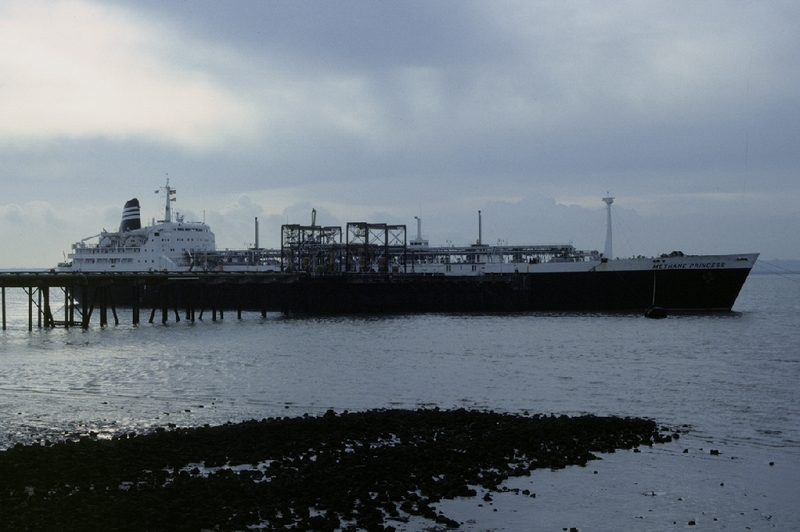 1981 laid-up alongside sistership Methane Progress in Fal. 1988 re-activated by Falmouth Shiprepairers and carried eight cargoes on charter to British Gas before laid-up again in the Fal. 1997 scrapped Alang. Ronald E Tait Orkney 2nd steward 1971 Just to confirm,I never sailed on the Methane Princess,this is an error. I SAILED ON THE Mathane Progress..
Mike Nicholson deck cadet 1979 My first trip, fastnet yach race, people smuggling whores onboard, transvestite stewards. A shock to the system. In February 1972, I was 3/O of "Methane Princess" with Capt. Stanley Dean. We were homeward-bound from Arzew, for Canvey Island, and approaching Portland Bill with a howling gale and heavy swell from the West i.e. astern. During my 2000-2400 watch, I sighted a very faint white light ahead, but because of the flying spray, I could not figure out how close it was. Nothing was "painting" on the radar. I altered course 10 degrees to Starboard and as I did so, the white light was obscured by a red flare and clouds of smoke; the light was obviously very close. I hit the General Alarm and rang "Standby". I went to the Port bridge-wing, and saw a small sail-boat pass through the loom of the red side-light. When Capt. Dean arrived in the Wheelhouse, he took the con, and directed me to transmit "Mayday Relay". Capt. Dean was a masterful ship-handler, and he manoeuvred the "Methane Princess" (single-screw, steam turbine, no bow-thruster) astern into the teeth of the gale, and made a lee for the sail-boat. The lone occupant of the sail-boat "Nomis" was practising for the Single-handed Transatlantic Race, when he was thrown, and he suffered several broken ribs. We threw him a heaving line, and attached a polypropylene mooring rope to it, but he was too badly injured to heave it in. He was, however, able to get his outboard motor started, and with "Methane Princess" providing a lee, he was able to motor towards Portland Bill. The Portland RNLI boat launched bringing a doctor (who was also a yachtsman) and the story had a happy ending. After leaving North Africa with a full cargo of methane gas, the ship proceeded to the South of France to discharge. We were anchored 2 miles off the french coast .During a lightning storm the ship's uprise was struck by lightning and burst into flames. It was 2am and all the alarms sounded. We had just watched all our movies and everybody was pissed! The Crew Messman (Stevie) was standing at the top of the stairwell from the lower deck accommodation shouting "big explosion on deck, everyone up". The Chief Cook (Fred), after being told that the ship was on fire, turned in his bed and said "let her burn". The 2nd Cook and Baker and Saloon Steward were out on deck, saw the flames from the uprise, and decided to launch lifeboats and abandon ship. The Saloon Steward took a heaving line and threw it over the end and proceeded to climb down it. Meanwhile and Chief Officer and Chief Engineer were running aft to release the CO2 to try and extinguish the fire, tripped over the leaving line and fell in a heap. They followed the line to where it went and saw the Saloon Steward with life buoy wrapped round him climbing down into the water. He was told to get back on board, to which he replied "France is 2 miles over there and that's where I'm going. Not back on that bomb". The 2nd Cook had the life boat lowered down to embarkation deck and I, the Galley Boy, along with the Chief Mate and the Chief Engineer, seemed to be the only ones doing our fire duty. My duties were to close all doors and ports on masters and saloon deck, to which I locked the old man in his cabin. Thankfully for all of us the Mate and Chief Engineer got the fire under control. I was only 16 and thought my life was over. Tears running down my face and my life flashed before me just waiting for the big bang. I was onboard during the first Gulf War, I had a visit from the Royal navy, and ended up starring in a training film for chemical warfare gear,after that many films were made onboard for walport,safety films,exploding purifiers and the like, It was a great time, the girls from Famouth were very friendly,as i recall.I stayed in a hotel in Truro, stuffy place, however on Eric Westons approval moved to a fantastic boat house up by the Herron pub,the owner of the boathouse lived in the large house above with terrific views of the Fal, he was building a boat to sail around the world in with his wife , however she wouldnt go,and leave her cat,so one night over a few beers in the boathouse a devilish scheme was concocted to be rid of the problem,who knows of the outcome.Anyway great times, and good memories of the Princess.Too many stories to recall. Steve A. This was my prize for being good boy on the Plagiola. The chief engineer was a Scot and promoted me while on board. My brother came on board from a 'Hungry Hain' and was amazed that we burnt the excess LNG with the bunker fuel to give us a perfect flame. Wife was also visiting me on Canvey Island, but didn't spoil a wonderful trip! I sailed on the methane princess for three mounths as galley boy in 1966, my first ship after training school at gravesend. i loved geting back to canvey island,as the people were nice,i always did the 4 to 8 watch. 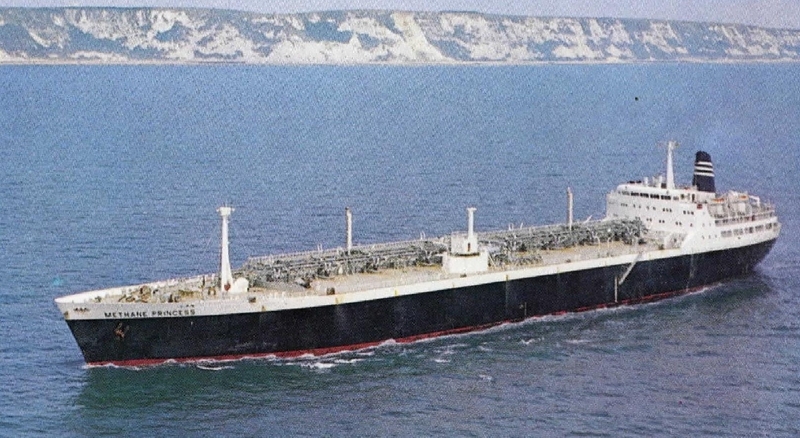 the methane princess, was my first ship after leaving gravesend training school. it was great for me as it was 10 days round trip. my dad worked on the canvy island oil refinery, him and mum would come and visit me and get drunk in my cabin. one day mum went up on deck with a ciggeret in her mouth, needless to say she got shouted at and so did i. Myself & George Elliott were onboard during the seaman's strike from May to July 1966 with the ship laid up at Canvey Island and found our 'new' duties included cleaning cabins and helping in the Galley. There were more exciting moments when there was a major internal hull leak with methane on board and welders at Tilbury managed to set the ship on fire. At Arzew in Algeria a lightning strike during loading set the gas risers alight and we looked like refinery flares. Have you sailed on Methane Princess (1)? Log in and add yourself as a sailor to the Methane Princess (1)! Log in and add your personal story to the Methane Princess (1)!